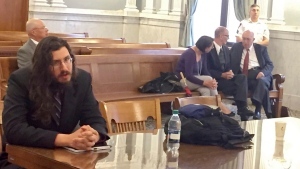 SYRACUSE, N.Y. -- In a real-life case of "Failure to Launch," an upstate New York judge Tuesday ordered a 30-year-old man to move out of his parents' house after they went to court to have him ejected. Michael Rotondo told the judge he knows his parents want him out of the split-level ranch they share. But he argued that as a family member, he's entitled to six months more time. Rotondo told reporters he'll appeal. The parents didn't answer a call seeking comment Tuesday and their letters, filed in court, don't give their reasons for wanting their son out of the house. They do tell him to get a job and move his broken-down Volkswagen Passat. "Michael, here is US$1,100 from us to you so you can find a place to stay," a Feb. 18 letter starts. It goes on to suggest he sell his stereo, some tools and any weapons he may have to gain money and space. "There are jobs available even for those with a poor work history like you," the letter reads. "Get one -- you have to work!" It's signed "Christina and Mark Rotondo." With reporters watching in court, Michael Rotondo sparred with Greenwood for 30 minutes, at one point refusing the judge's request to work things out directly to his parents, who were sitting quietly nearby. When Greenwood called Rotondo up to the bench, the long-haired and bearded son tried to bring the podium with him -- noting it held the reporters' microphones. He then called out for television camera crews to meet him outside the courthouse. There, he answered their questions, telling them he occupies a bedroom in his parents' home, doesn't speak to them and isn't ready to leave home. He said he had a business but wouldn't elaborate. "My business is my business," he said. The judge instructed the parents' lawyer to draft an eviction order. Attorney Anthony Adorante said it would give Rotondo reasonable time to vacate. In the 2006 Matthew McConaughey romantic comedy, the grown son's parents hire a woman to try to speed their son's exit.